Chatted some with Roy Halladay today about his decision not to take part in the World Baseball Classic, even though Team USA tried to bring him on board. Halladay has been camped at his locker, watching the tourney’s early games and he said he’s definitely a fan of the event. As far as taking part in it, well, that’s a different story. 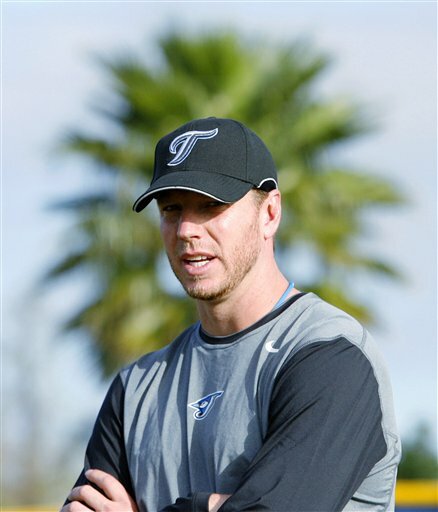 Given the timing, Halladay prefers to stick with the Jays. His spring schedule usually calls for him to gradually add in his various pitches at different points throughout the month, and pitching in the WBC would mean he’d have to use all his pitches earlier than usual. That, in short, is Doc’s main reason for staying in camp. Asked if he would consider taking part if the Classic was held at a different point in the year, Halladay said he just wasn’t sure. As a pitcher, it’s tough no matter when it’d be held. At this time in spring, he hasn’t worked on all his pitches. During or after the season, and you risk injury due to being overworked. Team Canada can count its blessings, though. Doc probably would’ve been on the mound today at Rogers Centre if he was suiting up for Team America. Pregame items: Blue Jays manager Cito Gaston said havign catcher Rod Barajas playing for Mexico in the WBC is actually good for the club. It’s helped Gaston find more playing time for the catchers who are vying for the backup job. … Reid Santos, Fabio Castro, David Cooper, Brandon Fahey, Wayne Lydon and Kyle Phillips have all been returned to Minor League camp. The Jays now have 60 players in camp, 36 on their 40-man roster. … Making the trip to Sarasota tomorrow: J.P. Arencibia, Michael Barrett, Joe Inglett, Lyle Overbay, Scott Rolen, John McDonald, Adam Lind, Travis Snider and Adam Loewen, among others. Brett Cecil and David Purcey will pitch. … On Monday, Brad Mills and Casey Janssen will pitch.